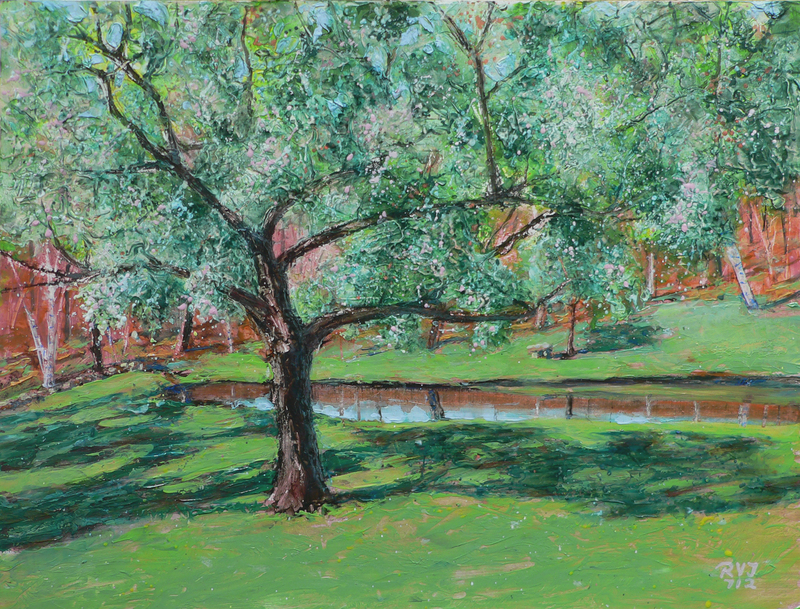 This painting is of my neighbor John and Denise’s apple tree in full bloom by their pond this past spring. It is a teaser for new work that I will be posting later this week on my web sight RVJart.com . Be sure to check it out. It was only a month ago that the web sight surpassed 15,000 hits. With your help it is now past 20,000 hits in record time. Thank you! That is a beautiful painting, Roger… Looking forward to seeing the rest. Gorgeous painting, Roger. I look forward to seeing the rest. It is a beautiful painting Roger! It brings wonderful memories to mind. What people don’t know is that behind that tree is an old fashion swing on a larger tree that takes out you to the middle of the pond. I haven’t been on a swing in such a long time and this experience was one I will never forget. Sophia, my daughter, loved it as well, but she as a seven year old swings often where I haven’t in years. This place is truly majical to me and your picture brings me right back to that time. Thanks Roger. Thank you for the remembrance Tina. It is a peaceful spot.